In the 1920s artist Douglas MacPherson shone a light into the darkness. 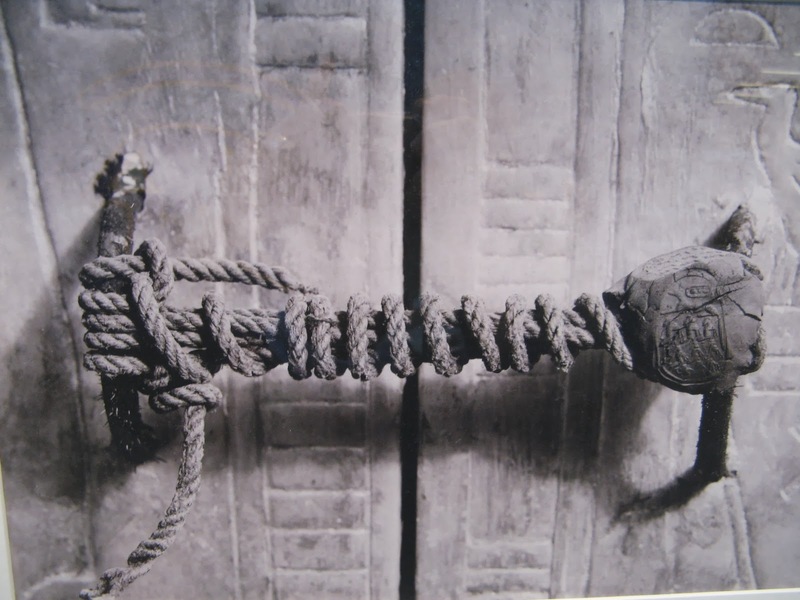 He unlocked King Tutankhamun’s sealed tomb and cut-away the London’s Underground to reveal wonders beneath the city’s streets. 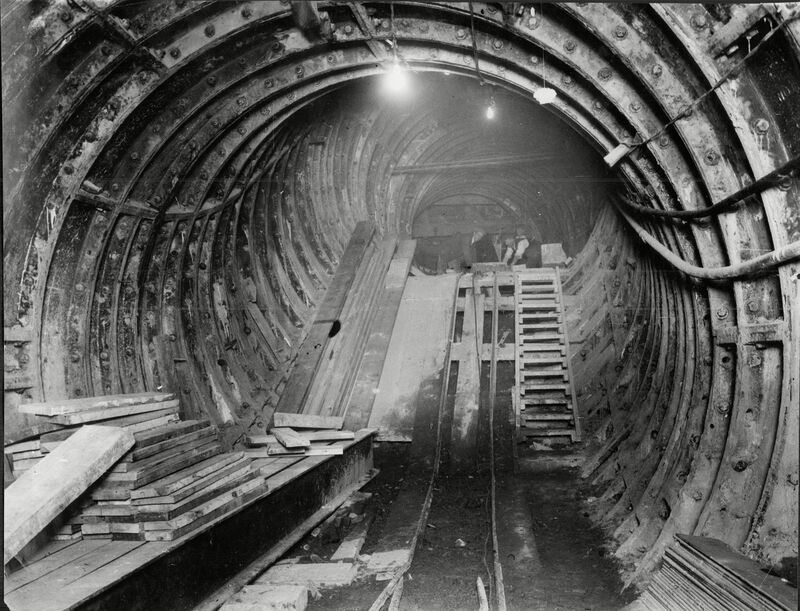 The re-building Of Piccadilly Circus Underground Station (1926). Charles Holden (1875-1960) designed more than 40 Tube stations for London Transport, including his revamp of Piccadilly Circus station. Hired by London Transport’s chief executive, Frank Pick, Holden’s brief was to create places in accordance with the design philosophy “fitness for purpose”. 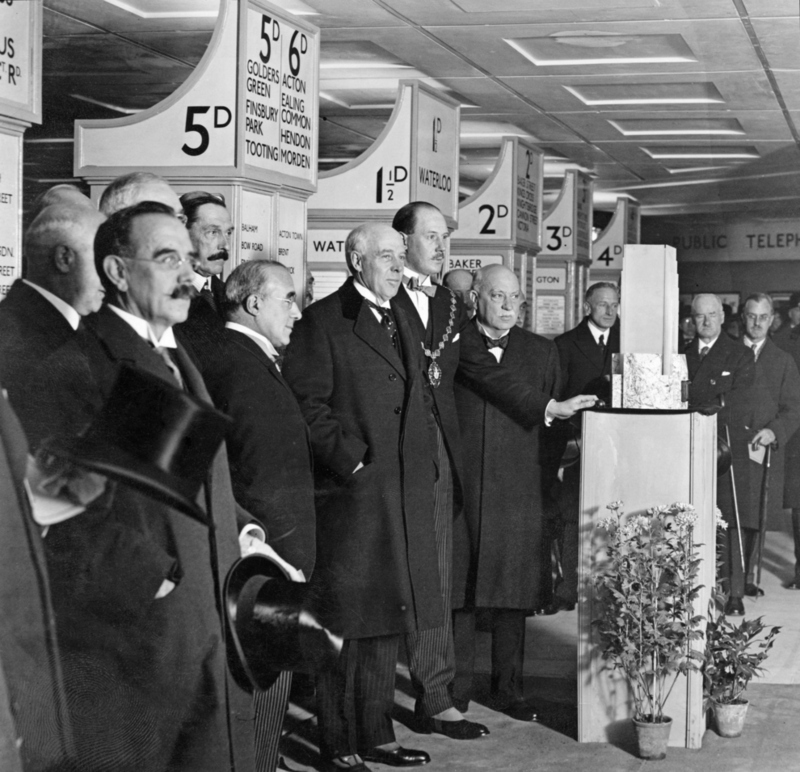 Opened in 1906, Piccadilly Station was by the 1920s too small and inefficiently arranged to work well. 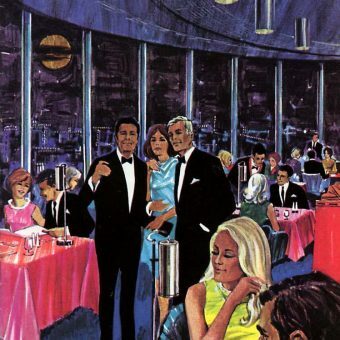 The surface-level booking hall was hopelessly inadequate. 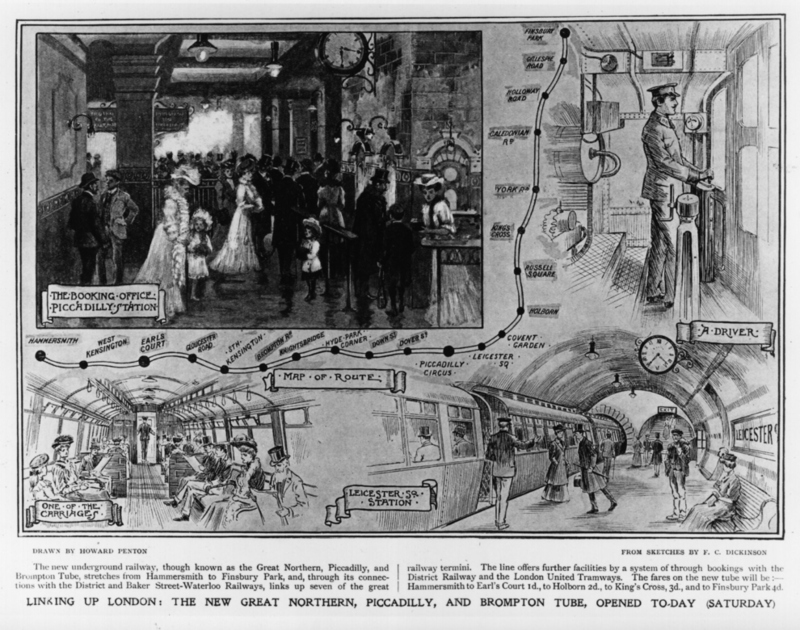 Map and illustrations showing the new Great Northern, Piccadilly and Brompton underground tube route, linking London stations from Hammersmith to Finsbury Park, 1906. 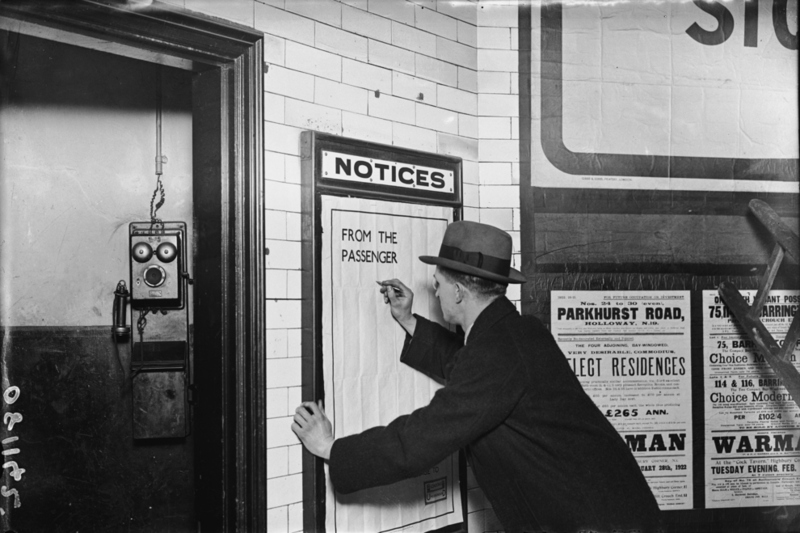 A man writing on a complaints poster, 1922. After a four-year project the new station was unveiled in 1928. 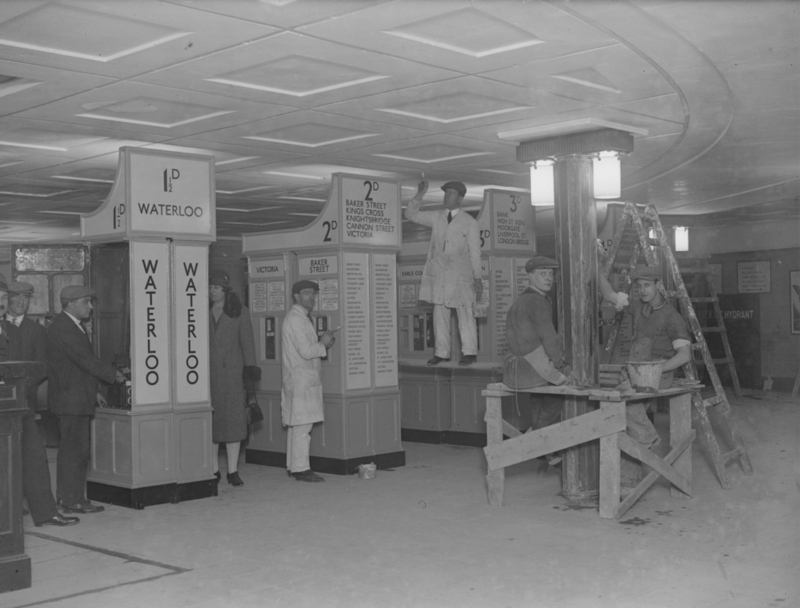 Construction work at the ticketing area of the new Piccadilly tube station, 1928. 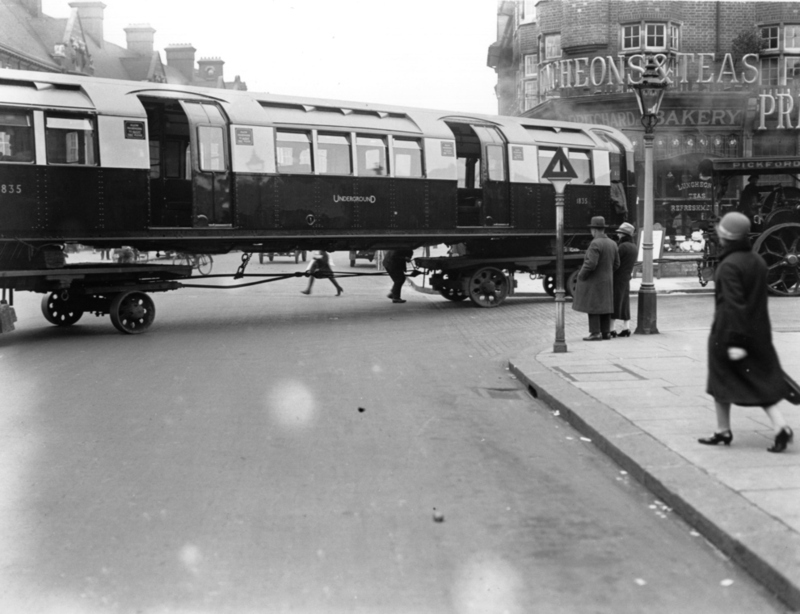 The Mayor of Westminster turns on the escalators at Piccadilly Circus in 1928. 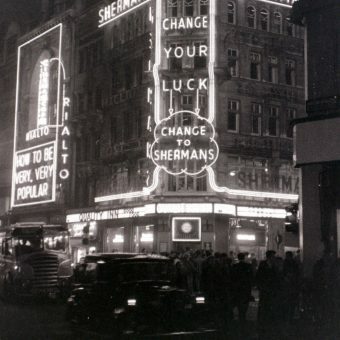 The new Underground station at Piccadilly Circus was opened on Monday. Only a small red and white awning on the pavement marked the entrance to one of the most remarkable feats of engineering of the century. Through this station 50,000,000 people will pass every year, as against only a mere 25,000,000 in the old Piccadilly station. A few steps lead down to a low, circular arcade of pale brown marble with a dull white floor, in the centre of which is a supporting pillar. Round it are tall bronze lamps and bronze framed windows in which are displayed such articles of clothing as attract open-mouthed crowds. Entering from the Haymarket end one sees on the opposite side two large tunnels, one having three and the other two flights of moving stairs with more bronze lamps down the centre – and only in an empty hall can one appreciate the weird effect of a flight of stairs coiling and uncoiling itself from inside a tunnel. But what about what the passengers and shoppers could not see? 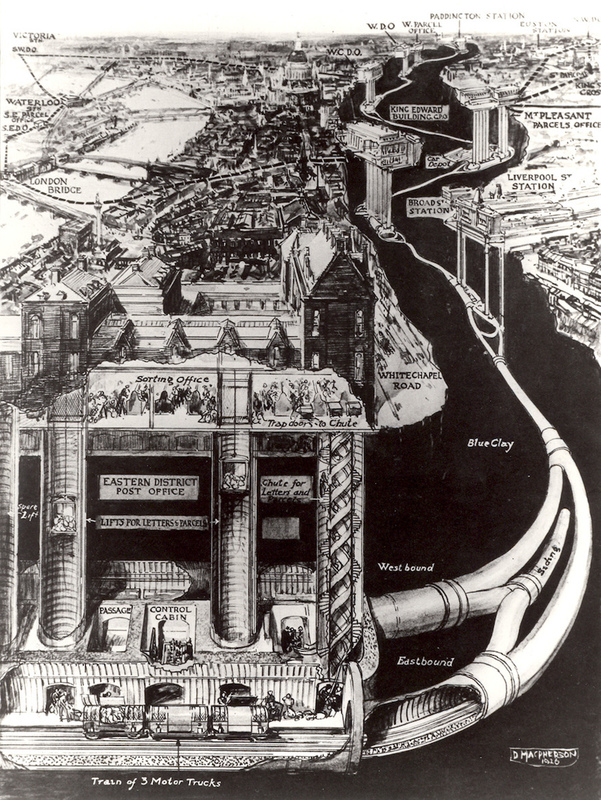 Mail Rail 1926 cutaway of the entire route, by Douglas MacPherson. Also working on the London Underground’s building and branding project was artist Douglas MacPherson (1871 – 1851), a member of St John’s Wood arts Club and the Arts Worker’s Guild. 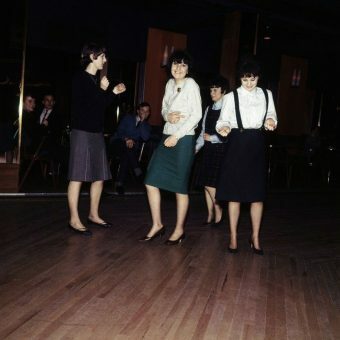 MacPherson studied art at the Westminster School of Art. He was an illustrator for William Luson Thomas’s weekly Graphic – renamed the Daily Graphic in 1898 – from 1890 to 1913, working alongside such artists as Sidney Sime, Alexander Boyd, Frank Brangwyn, Edmund Sullivan, Phil May, Leonard Raven-Hill, George Stampa, James H. Dowd, Bert Thomas and F. H. Townsend. In 1898 the Daily Graphic despatched him to Cuba to cover the war between America and Spain. When King Carlos I of Portugal and Crown Prince Luiz Phillipe were assassinated in Lisbon on 1st February 1908, MacPherson was despatched by the Daily Graphic to cover the story. 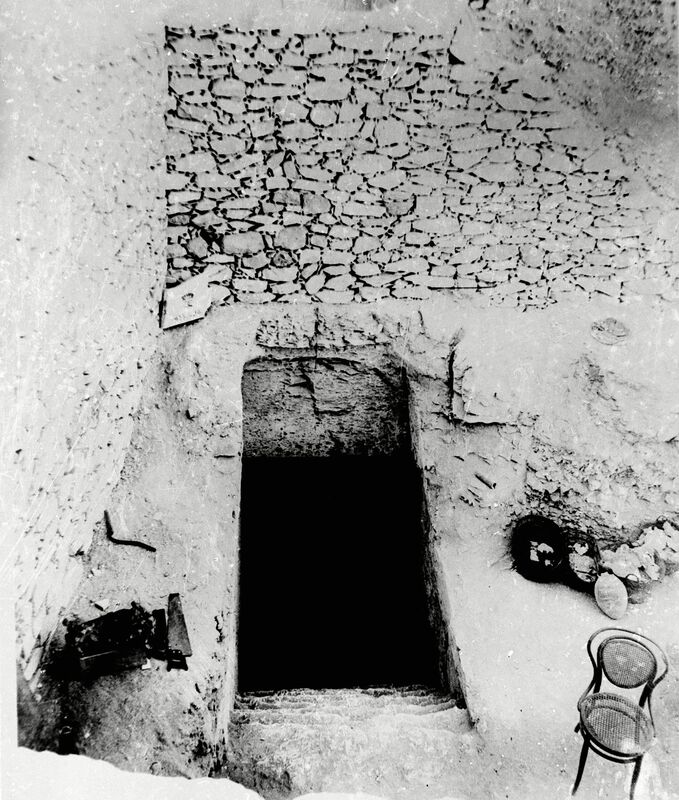 When Lord Caernarvon and Howard Carter team in 1922 went to Luxor and excavated the tomb of King Tutankhamen, Douglas MacPherson was the only artist sent to make watercolour drawings at the opening of the Tomb and the Sarcophagus. His paintings stored in the archives of The Sphere were destroyed during the blitz in World War II. 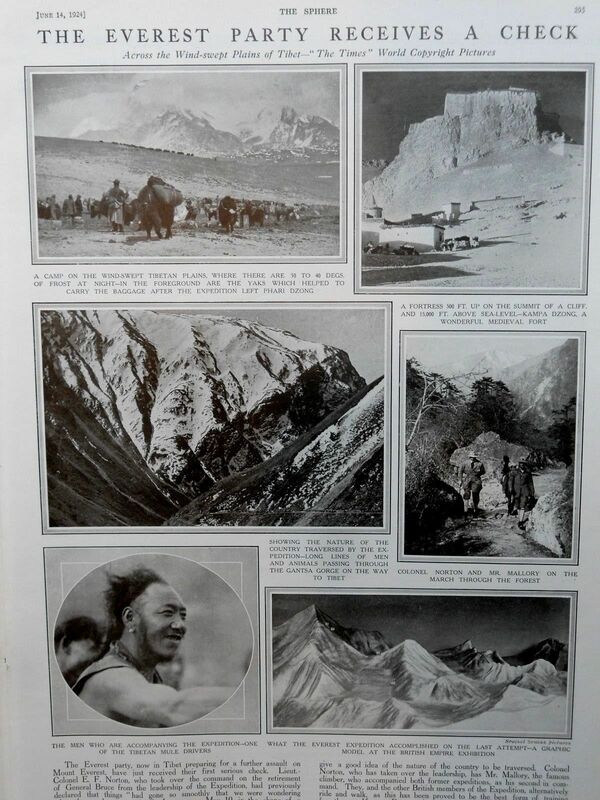 Following the excitement of the Tutankhamen discoveries, his next big project was the first Everest expedition. In 1924 he was commissioned to paint in black and white aerial views of the route of ascent from photographs. He also produced the poster for the film show of the expedition. 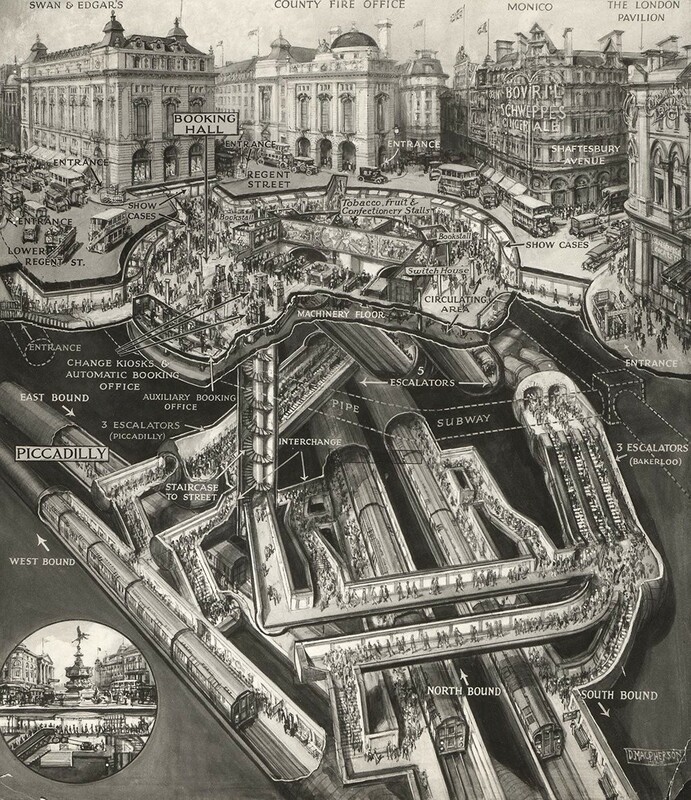 As well as travel posters, Douglas produced diagrams, maps and guides, no more fabulous than this Cutaway diagram of Piccadilly Circus station from 1928. Piccadilly station, the hub of London’s vast Underground railway system is one of the busiest points in the whole network. It holds the record for the only station in the world with as many as eleven escalators. On each of the tubes, whose tracks cross here, the frequency of service in the ‘rush’ hours rises to forty trains an hour on each line of metals. The station is planned on modern, entirely sub-service lines, with batteries of electrically operated ticket machines, automatic booking office equipment, triples escalators and every device to expedite the flow of passengers.